Address This toolbar contains a text box into which you can type a local address (such as a folder or file path), a network address (a UNC path), or an Internet address. When you press Enter or click the Go button, Windows XP loads the address into Windows Explorer (if you entered a local or network folder address), an application (if you entered a file path), or Internet Explorer (if you entered an Internet address). In other words, this toolbar works just like the Address Bar used by Windows Explorer and Internet Explorer. Links This toolbar contains several buttons that link to predefined Internet sites. This is the same as the Links toolbar that appears in Internet Explorer. Windows Media Player This toolbar contains controls for playing media. When you activate this toolbar, it appears when you minimize the Windows Media Player window. Quick Launch This is a collection of one-click icons that launch Internet Explorer or Media Player, or clear the desktop. Other applications—such as Microsoft Office—also add icons to this toolbar. Desktop This toolbar contains all the desktop icons, as well as an icon for Internet Explorer and submenus for My Documents, My Computer, and My Network Places. To toggle these toolbars on and off, you must first right-click an empty spot on the taskbar. In the shortcut menu that appears, click Toolbars and then click the toolbar you want to work with. View This command displays a submenu with two options: Large Icons and Small Icons. These commands determine the size of the toolbar’s icons. For example, if a toolbar has more icons than can be shown given its current size, switch to the Small Icons view. Show Text This command toggles the icon titles on and off. If you turn on the titles, it makes it easier to decipher what each icon does, but you’ll see fewer icons in a given space. Show Title This command toggles the toolbar title (displayed to the left of the icons) on and off. Right-click an empty spot on the toolbar, and then click Toolbars, New Toolbar. Windows XP displays the New Toolbar dialog box. Click OK. Windows XP creates the new toolbar. Before you begin these steps, make sure that the taskbar isn’t locked. Right-click an empty section of the taskbar and then click Lock the Taskbar to deactivate it. Also, make sure that the desktop is visible by minimizing all open windows (right-click the taskbar and then click Show the Desktop). Create shortcuts in this new folder for your favorite documents and programs. Create a new taskbar toolbar that displays the contents of the new folder. Drag the left edge of the new toolbar and drop it on the desktop. Windows XP displays the toolbar as a window. Drag the toolbar window to the left edge of the screen and drop it when the toolbar expands to fill the left edge. Right-click an empty section of the toolbar and activate the Show Title, Show Text, and Always on Top commands. The Always on Top command ensures that the toolbar is always visible, even if other windows are maximized. You can size the toolbar by dragging (in this case) the right edge to the left or right. If you prefer, you can display the toolbar on the right or top edge of the window. To move it, first drag it from the edge and drop it on the desktop. Then drag the toolbar window and drop it on the edge you want to use. If you have enough room, you can display multiple toolbars on one edge of the window. For example, you could add the Quick Launch and Links toolbars for easy access to their shortcuts. To do this, display the other toolbar, drag it off the taskbar, drop it on the desktop, and then drag the toolbar window to the edge of the window and drop it on the toolbar that’s already in place. You might need to drag the top edge of the toolbar up or down to see its icons. Figure 1. The new toolbar appears on the left edge of the screen and is visible even when other windows are maximized. Right-click the taskbar and then click Properties. (Alternatively, open Control Panel’s Taskbar and Start Menu icon.) 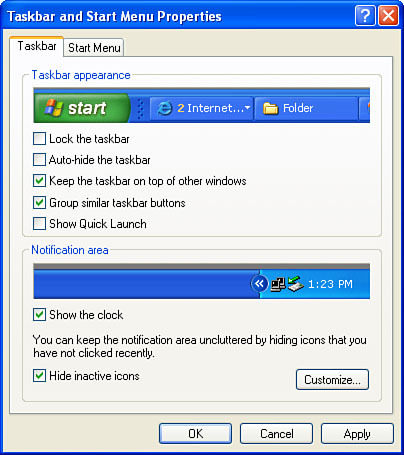 The Taskbar and Start Menu Properties dialog box appears with the Taskbar tab displayed, as shown in Figure 2. Figure 2. Use the Taskbar tab to set up the taskbar for improved productivity. Lock the Taskbar When this check box is activated, you can’t resize the taskbar and you can’t resize or move any taskbar toolbars. This is useful if you share your computer with other users and you don’t want to waste time resetting the taskbar if it’s changed by someone else. Auto-Hide the Taskbar When this check box is activated, Windows XP reduces the taskbar to a thin, blue line at the bottom of the screen when you’re not using it. This is useful if you want a bit more screen room for your applications. To redisplay the taskbar, move the mouse to the bottom of the screen. Note, however, that you should consider leaving this option deactivated if you use the taskbar frequently; otherwise, auto-hiding it will slow you down because it takes Windows XP a second or two to restore the taskbar when you hover the mouse over it. Keep the Taskbar on Top of Other Windows If you deactivate this option, Windows XP hides the taskbar behind any window that’s either maximized or moved over the taskbar. To get to the taskbar, you need to either minimize or move the window or you need to press the Windows logo key. This isn’t a very efficient way to work, so I recommend leaving this option activated. Show Quick Launch Activate this check box to display the Quick Launch toolbar, discussed earlier . Quick Launch is a handy way to access Internet Explorer, the desktop, and Windows Media Player (as well as any other shortcuts you add to the Quick Launch folder), so I recommend activating this option. Show the Clock Leave this check box activated to keep the clock displayed in the notification area. Hide Inactive Icons When this check box is activated, Windows XP hides notification area icons that you haven’t used for a while. This gives the taskbar a bit more room to display program buttons, so leave this option activated if you don’t use the notification area icons all that often. If you don’t use the icons frequently, deactivate this option to avoid having to click the arrow to display the hidden icons. If your notification area is crowded with icons, it’s inefficient to display all the icons if you use only a few of them. Instead of showing them all, leave the Hide Inactive Icons check box activated and click Customize. For the icons you use often, click the item’s Behavior column and then click Always Show in the list that appears. This tells Windows XP to always display the icon in the notification area.